In 1993 WISMA KEIAI ( old name〜Wisma Kyoei Prince ) was built by a joint venture of Japanese and local campany through a Toda Corporation, a famous construction company. Since then, WISMA KEIAI has been one of high quality office building in Jakarta, Indonesia and it remains the same until now. ・Back access entrance gate to enter WISMA KEIAI complex in order to avoid 3 in 1 traffic regulation. ・Banking facilities , post office, mini market, travel agent, golf shop, cafe, foot massage, and restaurants. ・9 high speed elevators, which are divided into 2 zones. 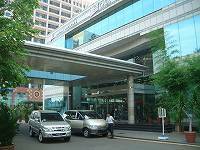 ・Jakarta Kyoai Medical Check Up Service is here for you with a complete services and experienced doctors for all your medical needs. Many restaurants and shops are here in Wisma Keiai. You can surely enjoy it !